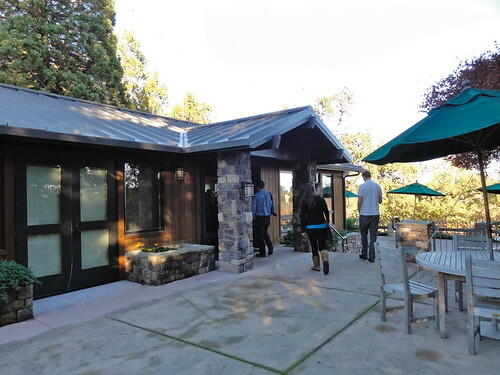 Last year we got in 2 quick trips to the Bay Area, with 2 rounds of wine tasting, two rounds of tasty eating, and a lot of fun. I’m going to go back and forth between the 2 trips for the next few posts, starting with our most recent wine tasting route. 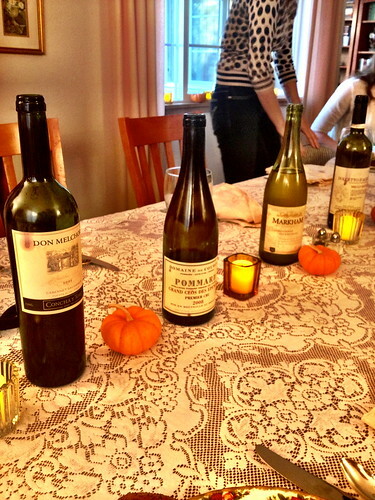 In 2011 we started a new Thanksgiving tradition – Black Friday Wine Tasting. Greg’s family is full of oenophiles, and when we have Thanksgiving in the Bay Area, the wine is almost as big deal as the food. Over the years, the usual practice of everyone bringing a bottle or two to Thanksgiving dinner has been evolving into a rather elaborate game of wine show and tell. It’s serious. 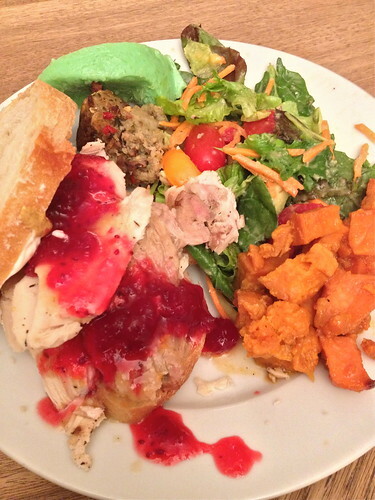 A small sampling from the Thanksgiving table. Black Friday wine tasting was kind of the natural evolution, especially since the hosts, my sister-in-law and her husband, live right in the middle of wine country. 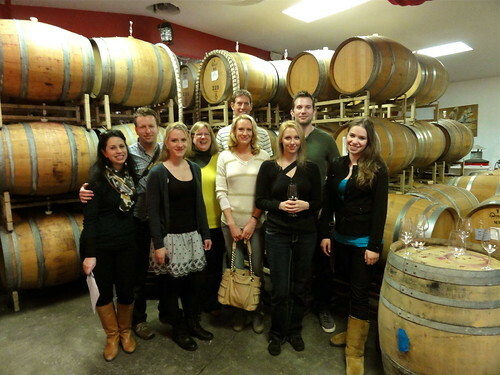 Moreover, they have a big family, and as the younger members are growing up and pairing up, the wine fervor gets passed on, and our wine tasting party gains members every year. We’re a tour group all on our own. This year we hit up three wineries, and no misses. 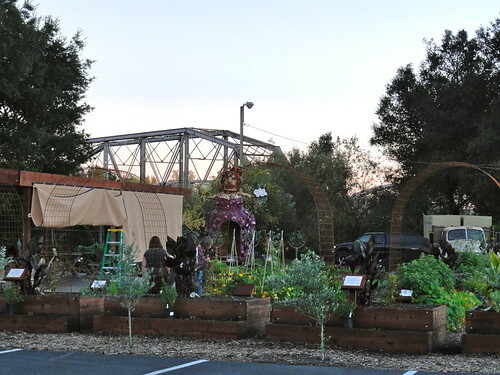 On this trip we kept to the Russian River Valley/Healdsburg area. 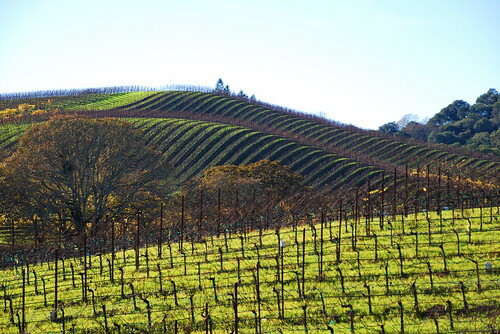 The trip kind of became a Pinot journey, since that’s one of the main varietals this area is known for. All of that said, however, for most of our wine drinking lives, Greg and I were on a pretty restricted budget. In the movie, Miles’ whole reason for loving this grape is because, much like him, it’s kind of cranky and finicky. He meditates on how it’s thin skinned, hard to grow, and particular about the locations in which it will do well. All of this can translate into extra $$$'s on the price of the wines, or really schlocky bottles at the low-end where you just really can’t be sure of what you’re going to get. If you’re a budget-conscious consumer, Pinot is not your best friend. Values are out there, but they’re harder to find in my opinion. And let’s be honest, we’ve not only been budget-conscious, we’ve often fallen more into the category of cheap-asses, and thus, we didn’t spend a whole lot of time on Pinot when we’d tour CA wine country while we lived in Cali. This was new ground for us, and we made out pretty well. We learned a few things and came out with a renewed appreciation for the grape. Our first stop of the day was Joseph Swan. They have a small operation and the barrel room doubles for the tasting room—I love it when the tasting area is amongst the barrels. It adds to the romance somehow. Our family group could have easily taken over the entire space. Luckily, they were very accommodating and despite the fact that a 6-person group limit is announced on a sign on the door, they set us up for a tasting and even kindly took pictures for us. 2012's Black Friday tasting troop. They may have been the first up, but we also found the best value of the day here. Their 2010 Cuvée de Trois (despite the name, this wine has a grape selection from four vineyards) had a little vanilla the nose, a bit of compote on the palate, but also with enough brightness the give it a lift. At $29, we thought this was a good buy. To be honest, we ended up at Rochioli by accident. Greg accidentally got misdirected on Google Maps when he meant to look up another winery. However, when we got there, I realized I knew them to have good reputation and our clan went in. I liked everything we tried, albeit it was a short selection of three. We took two. The 2011 Special Cuvée Pinot Noir ($40) was a more sleek and elegant Pinot, with notes of cranberry and strawberry, a bit of wood spice, tea, and just a hint of earthy mushroom. We also took a bottle of the 2010 Ranch Red, a blend of 60% Syrah with a 20% each Petite Sirah and Zin. This one had lots of black and red berry flavors, plums, with a little stoniness. Another decent buy at $28. Last, but certainly not least, was Davis Family Vineyards. 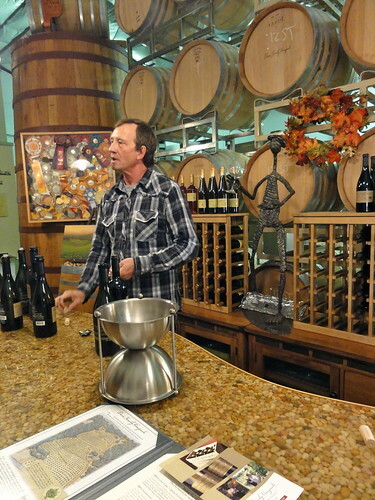 This was a fun visit because the owner and winemaker, Guy Davis, was behind the counter in the tasting room that day . . . on his own. He’d wanted to give his staff the day off to spend with family, it being Thanksgiving weekend and all, and now found himself facing a full house of tasters who all had a similar idea to ours and preferred to spend the day sipping wine rather than fighting through retail mobs. Our giant pack landed on the place at a particularly busy moment in the afternoon and we had to wait a moment while space cleared up at the long narrow bar. We didn’t have to wait all that long though, maybe 5 to 10 minutes, but Mr. Davis felt bad all the same and when we finally got up to taste he poured us a couple of extra tastes and spent a little extra time talking to us about his wines. We ended up taking a bottle of the 2010 Russian River Valley Pinot Noir. This wine has a blend of grapes from three vineyards. It was rich and had notes of black cherry pie filling, raspberries, and warm baking spices. We also took a bottle of the 2005 Rapport, a port-style wine with old vine Zin amplified with Petite Syrah. This was a pet project of the winemaker’s and was quite lovely. 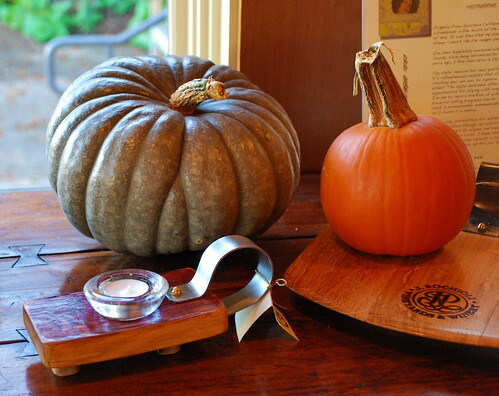 It had lots of berry flavors with mocha notes and enough acidity to keep it all in balance. Yummy would sum it up. Several of the other Pinots were also very nice. 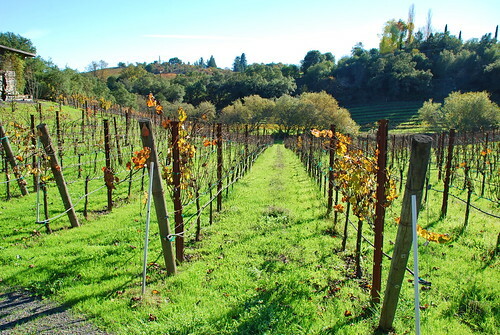 Including the 2007 Estate Grown Russian River Valley Pinot Noir, with its nicely integrated tannins, and the 2010 Soul Patch Pinot Noir, the grapes for which were selected from a favorite site. It had nice structure with pomegranate and cranberry notes. I really liked this one, but there was only so much we could take home. And with that we took our loot and wrapped up the 2nd Black Friday Wine Tasting, and went home to have Thanksgiving leftovers to soak up the wine. 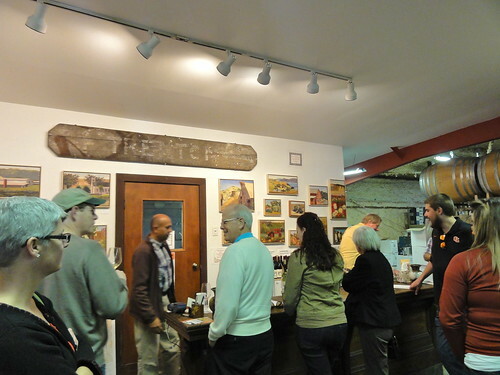 A quick note on wine tasting in the area: Generally you don’t need to make appointments here. It’s all pretty low-key and you can just show up at tasting rooms. Many also have picnic areas outside, should you want to pack a lunch or take a snack break—always a good idea I think when wine tasting. The usual practice here is to charge for tastings, but the fee is waived after the purchase of a bottle. If you're planning a trip, The Wine Road, Northern Sonoma County, has useful info and maps for navigating the area. Next up will be a Zins in Dry Creek.